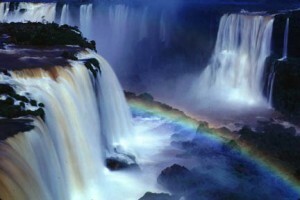 The Iguazu Falls are together with the Glacier Perito Moreno, the great icons of tourism in Argentina. 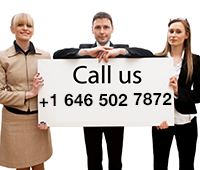 With 01argentina Travel agency you will have all the information you need to plan your vacation package to the Iguazu falls. The iguazu falls are extreme beauty, they are an earthquake for the senses, unique experience, all that and more we can say about the vacation packages in the Iguazu Falls which are located in the northeast, where Argentina meets Brazil and Paraguay borders. The Iguazu Falls vacation packages captivate the traveler by the immensity of its stream, also by the grandeur of nature and the magnificence of their surroundings. Taking a vacation package to the Iguazu falls includes bright green leaves and giant flowers, red earth, animals seen or intuited through the foliage and heat exacerbating the senses. We read in a travel book an expert guide from Iguazu wondered why the jungle doesn’t have as good image as Patagonia, he wondered why it seems that the cold and snow were more “elegant” than the tropics and the jungle. We do not know if this is indeed so, but we can assure travelers that venture with a vacation package to this part of the continent that this supposed contradiction has no reason to be. If your vacation package in Argentina can combine the ecstasy of contemplation of the Perito Moreno Glacier with the sensory euphoria of a hike to the foot of the Devil’s Throat, you will be privileged. 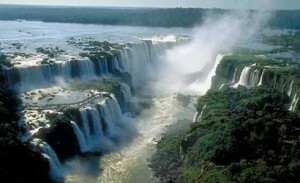 Do not miss out the opportunity of taking a vacation package to the amazing Iguazu Falls. 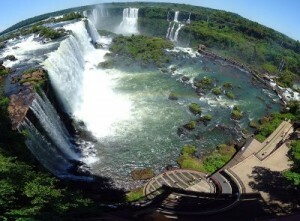 Within the National Park there are a variety of options to add in your vacation package in the Iguazu falls including walking tours, boat in the Iguazu falls Railway or by car.Our vacation packages in the Iguazu falls always includes a full day tour to the Argentine side of the Iguazu falls. We start this tour with a visit at the Visitor Center yvyra Reta, “land of the tree” in Guarani language, which is just 50 meters from the gateway, on the hand right. In this center you will find lots of information that will allow you to capitalize on their walks in the area. Discover that the huge and spectacular waterfalls are not all in the Park, there is also a vast diversity of wild flora and fauna and a history that dates back thousands of years. Wanda mines, San Ignacio ruins and typical food.